Looking forward to the two Bank holidays and especially the Royal wedding was something that kept me going; something positive to celebrate with close friends; a nation rejoicing in the union of love and sanctity of marriage. Whilst I was not feeling my best, I agreed to organise a luncheon party to celebrate the day in style. I was looking forward to the planning and build-up of the event as it was going to be a day in history which I wanted to remember, with Great Britain at its best, carrying out the pomp and ceremony like no other country can achieve. However, I didn’t realise what lay ahead and how my world was about to be shattered and my heart broken. On Saturday 23rd April, the day after Good Friday, I had an unexpected and unsettling spiritual experience that shocked me. I was so taken by surprise that I didn’t question or try to decipher what the spirit world was trying to convey to me. Barry, my partner, and I went to bed as normal that evening but Barry was having trouble sleeping. He was going through a stage of suffering from insomnia. When he did eventually fall asleep, he snored! It was so loud that if snoring was an Olympic sport he would have been in line for the gold medal! I couldn’t bear it any longer and so I crept off to the spare bedroom in hasty retreat. I didn’t fall asleep there either; the room had a presence. I knew I wasn’t alone. All of a sudden spirit totally overshadowed me and I felt as if my stomach was being pulled, from behind, into and through the bed towards the floor, not gently but in a violent fashion. It startled me so much that I jumped out of bed and ran like hell back into bed with Barry. I looked at the clock and the time was 3.15 am. I didn’t appreciate what was trying to be conveyed to me at the time; I just wished that I’d paid more attention, relaxed and let spirit explain the relevance. However, my fear got the better of me and I ran away from an important lesson. 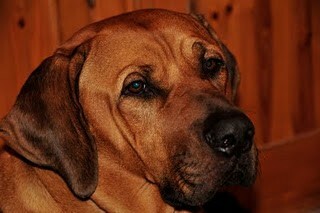 Zimba, my beautiful Rhodesian ridgeback, had been extremely lethargic for a few weeks and totally off his food. As a result, he was also losing weight. At the time the loss of weight did not concern me because we had put him on a diet. However, on the on the bank holiday Monday, 25th April, he became very shaky on his back legs so I decided to get him checked out. 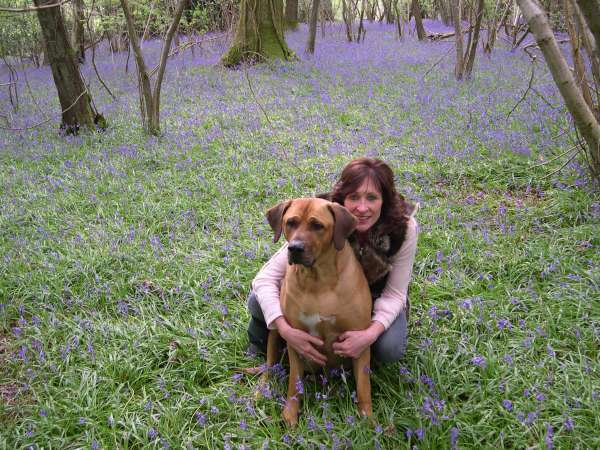 The vet on call that day assessed Zimba and diagnosed a tumour in his spleen. He did some further investigative tests and decided to operate. On opening him up the vet established that the tumour was cancerous and had spread throughout the stomach and into the main organs. He described Zimba’s inside as like “blackcurrant jam”. There was no alternative but to put Zimba down. Only then did I realise the relevance of my experience, they were showing me the exact spot of Zimba’s cancer. As you can imagine, I was absolutely devastated. I couldn’t believe what I was hearing. Zimba was just 5 years old and this just should not be happening. Barry was at a business meeting and I’d popped around for a cup of tea with my neighbour who is also a very good friend. I couldn’t bear being on my own whilst Zimba was going into surgery the vet insisted that I kept my mobile phone on so he could contact me for consultation. When the call came I had to restrain myself but I found it impossible. I called Barry to inform him of the bad news; everything just seemed to go into a big blur. I was on auto pilot and nothing seemed real anymore. I couldn’t bear the thought of going back to an empty home without my precious boy. I somehow mustered courage to go back and face the reality of what had just happened. I felt considerably more anguish over the death of Zimba than I did over the loss of my mother. I suppose because it was so unexpected, such a shock, a bolt out of the blue. My dear mother had had a stroke and had been in a home for 3 years before her passing, so I’d prepared myself for her inevitable death. Sudden death was life’s next lesson that I was now experiencing, a very painful one that turns your world upside down. One minute life is normal the next too painful to carry on. When Barry came home from his business meeting we just embraced trying to console each other. He must have found it so hard continuing his meeting holding back his feelings. The next hardest thing we had to face was to go back to the vet to pick up Zimba. I couldn’t stop crying. Barry had to be the strong one. He had to stop the car on the way home as I was hyper ventilating and wanted to be sick. I felt totally numb as we continued our short journey home. We had to establish a suitable spot for his final resting place and I watched Barry dig a grave in a spot where Zimba used to sit. I just sat in the car with Zimba, stoking him and telling him how much we both loved him and how we would miss him but, at the same time, telling him off for deserting us, and leaving us both desolate. We wanted to give Zimba a wonderful resting place where we could go and talk to him and feel close to him. A couple of weeks later Barry bought a beautiful flowering tree and planted it nearby in memory of Zimba. I know it will grow with beauty and stature just like him. I often used to say to Zimba “you’re my precious gift from GOD”, my heart was always full of emotion when I said those words. I didn’t realise that loving anything could ever be this painful. My heart felt like it was bleeding, ripped apart and would never heal or feel the same again. Even being a medium didn’t help knowing that he was in the spirit world, free from suffering and pain didn’t make my suffering any easier.The only comforting thought was when it’s finally my turn to “go home” to Spirit; I’d be reunited with Zimba. I trust that he’ll be the one who comes and gets me as he’ll know the way home. I was now left to pick up the pieces and make sense of the whole episode. Grief consumes you; it takes over your mind; it feels like a disease. You spend all your time in your thoughts, reflecting, blaming, feelings of anger and sheer loneliness. You don’t want to talk to anyone just be on your own and cry in self-pity. Your past memories of joy bring a level of comfort; they’re so powerful but it’s the negative thoughts that haunt and bring you the most pain; they’re the hardest to control, nipping them in the bud before they destroy you. I couldn’t believe my thought process; one minute I seemed normal and the next I had nothing but irrational thoughts. I wanted to see my Zimba again for one more time. I wanted to cuddle him and kiss and stroke his silky fur. I had a sudden urge to dig him up from his grave to see him just once more. I then had visions of what his physical body would look like – rotting carrion on which crows would feast. The very thought made me sick. I had uncontrollable feelings of pain which I couldn’t share with or talk to anyone about. My guide, Simeon, drew very close and explained. Grief is a natural response to loss. These were all normal feelingsof bereavement and accepting them as part of the grieving process and allowing yourself to feel what you feel is necessary for healing to take place. I had taken Zimba to see the vet on a number of occasions with the last two consultations being in January of this year. On each of those occasions I had said to the vet that there was something ‘radically’ wrong with him but the vet brushed my concerns to one side. I didn’t realise the relevance and power of my words at that time, but he never took me seriously or tried to pacify me by taking blood tests or X-rays. Zimba had constant leg trembling, lethargy and weight gain which I was concerned about. The vet just kept on insisting that he needed to lose weight and even though I confirmed that he was on a strict diet he did nothing to establish the route cause of why he was not losing any weight. In fact, between the two consultations in January, Zimba actually put weight on. The vet’s only reaction was to look at me with contempt. I believe if the vet had investigated the root cause of his condition at that time by taking blood tests and X-rays his life might have been saved. Regretfully, animals can’t tell you what is wrong with them, it is for us (me as an owner and, more importantly, the vet) to diagnose and investigate. As a loving owner I had a sense that something was wrong with Zimba and I expected the vet to take up my concerns and use his professional skills to make the necessary diagnosis. Not only was I left devastated and empty with a feeling of guilt that I could have done more to insist that the vet should have done what was necessary, but I then received a £700 bill, without even the decency of a covering letter! I wrote to the vet and asked him to reflect on my distress and concerns and, when pet owners bring in their cherished animals to see him, do take the time to listen to them and take them seriously. It will not only create a good reflection on him but also just might save or extend the lives of animals. Crying a whole ocean of tears did not ease my pain and I felt very let down by my spirit friends for not telling me or giving me any indication of Zimba’s illness until it was too late. Zimba was my ‘little shadow’ and, for much of the time, we we’re inseparable. Perhaps I loved him too much but was my canine soul mate. My lesson from the spirit world is that I’ve now experienced sudden death and the pain and suffering that goes with it. I just hope that I can use this most painful of lessons to help those who have suffered in the same way. I have never had children of my own and I suppose I treated Zimba as being of my own flesh and blood. Because of that I can liken my loss to that of someone losing a child and, as a Medium, the whole experience has been an invaluable lesson. What can be difficult when grieving for your pet is the reaction from those people who have never had pets of their own and who can’t relate to the raw emotion that you are experiencing. People often feel uncomfortable; most want to genuinely help but simply don’t know how. The words they choose are often clumsy or too harsh or just down right insensitive. They are probably saying to themselves, “it’s just a dog”. They can make you feel quite uncomfortable by their lack of understanding and well meaning comments. It’s beyond their comprehension what you are going through. They think it’s just a question of “pulling yourself together as it’s just a dog or cat that you have lost, not a human being!! However, losing a pet to many people is much like losing a member of their family or a close friend. For me, Zimba was like a child, the child I never had. The thought that I was never going to see him again in the physical sense was unbearable; spiritual contact would not be enough. The pain never goes away; you just learn to live with it. It’s like an emotional roller coaster; just when you think you’re making good progress something triggers and brings it all back to the surface. They say time is a great healer. I know Zimba’s spirit is very much alive. He’s going through a transition himself, having to adjust to his new surroundings which may take a bit of time but I know he’ll be back as soon as he’s able to make his presence known. Zimba was a wise old soul; I know that we’d been together in a past life and that’s why it’s difficult to come to terms with his passing; losing a true dear friend; one that I know where we’ve got a history together. I’d often look into his eyes and see that ‘knowing’. The eyes are a window to the soul and our bond was a kindred spirit. I often feel his presence in the garden, so I know he is trying to make contact. I send him my love and will keep sending him thoughts of encouragement and prayers to help him on his journey to continue his soul’s growth. He’s done and finished his work on earth, at least for the foreseeable future. I now look forward to receiving his help from the other side of life. Dreams are so powerful but at times they are more than just a dream they’re a reality; a way of communicating and conveying their message to us from the spirit world. When we’re so full of grief we often create a sort of barrier that the spirit world finds difficult to penetrate; to bring the comfort that we desire and demand. We’re also in such a fragile state, being down or depressed that there’s just not the energy to make a full manifestation. The dream state is therefore a vehicle that can serve a route where we can’t interfere by being in a state of total relaxation and our hearts at a level of peace. Zimba came in a dream on Thursday 5th may. The dream was so clear. I was conscious that Zimba was dead and became aware that his spirit wanted to embrace mine again with a brief cuddle. When we embraced it seemed so real and the emotions of being together again were amazing. As you can imagine, I didn’t want the experience to end but when it did I awoke with a start. The time was 3.15 am! The power and residue of that embrace remained with me and I felt comforted and distraught all at the same time. The experience stayed with me the whole of the next day with such intensity that I couldn’t even talk about it. I knew it was the first real contact we’d had together and I just wanted the next time to happen quickly. In fact, I couldn’t wait for the day to end so I could get to sleep and have another dream experience. You may wonder why I make reference to the exact time of the dream experience being 3.15 am. Every ‘physical’ spiritual experience that I’ve ever had seems to be at 3.15 am. It must be the witching hour for me!!!! My best advice to anyone who is seeking a vet with whom they can register their treasured pet, is to check with the vet medical board to see if there are any complaints lodged against the vet. I know there are good vets out there who do a brilliant job; regrettably, I feel that mine let me down. I’m not ashamed to say that I’ve shed rivers of tears, as indeed Jesus did when his friend, Lazarus, died. I find immense comfort from the 4th spiritualist principle: “The continuous existence of the Human Soul”. Spirit is part of the “Creative Force” and thus indestructible. After death the physical body is left behind whilst the soul continues to exist in a different dimension that we call the spirit world. Pets are precious gifts from God, but we don’t get to keep them nearly long enough!